The Bumper project’s authors realize that if children aren’t going to the library to read books, then the books will have to be brought to them. “No, we’re not going anywhere,” the driver said, sighing as he eyed an elderly lady approaching from the courtyard where his bus was stuck. “Why have you blocked everything? No one can get by,” the woman said. “Oh, what is this you have here?” the curious old lady asked as she peered into the bus window. “We’re bringing books to children,” the driver replied. The Bumper Children’s Book Bus was stuck in a Moscow courtyard, just 100 meters away from the school it was trying to reach. This unique humanitarian project serves as a bookstore on wheels, a children’s club and a counseling center all in one. We are sitting inside this bus as the driver desperately tries to pass through the narrow courtyard to the school. The Bumper team is headed there for an event to promote tolerance among pre-school children. Anna Tikhomirova, the director of the project, said today’s event will be based on author Pernilla Stalfelt’s book Cut from the Same Cloth. The children will read the book, look at pictures, play and talk about how we are all different and how we should deal with this. “Our grand idea was to work on the revival, or to be more exact, the creation of a culture of childhood in Russia, where, in addition to special projects, kindergartens, interesting schools and artistic initiative, there is still a respectful and proper attitude toward children and childhood. In such a world, the child is already a full-fledged and interesting person and not just a future contributor to the coffers. We have even set up the Childhood Culture Foundation. Bumper is only one of its projects,” Tikhomirova said. The Bumper Bus is a large, 1980 Mercedes. Anna leased the bus with an agreement to eventually buy it. “Of course, we’d like to have a newer bus that is better equipped, doesn’t get stuck and in general has wings,” Tikhhomirova said smiling. It’s cold in the bus, but the themed, customized interior reminded me of summer. Light blue and green bookshelves, striped ottomans on wheels, sliding tables and even a real bumper attached to the cash desk. There’s even an office, but no toilet. We are sitting on a large couch in the rear of the bus with light-green blankets and yellow pillows. Everything is bright and for children. All kinds of different books are sitting on the specially constructed shelves. It turns out most of the books are delivered from small publishers in small consignments. The books range from classic fairy tales illustrated by Viktor Vasnetsov to the newest Swedish storytellers and teenage short story writers. There are books that only pretend to be for children but actually describe real adult problems. “That’s how we explain them to parents,” another Anna, the project’s artistic director, says with a smile. Several books fall onto the floor as the bus jerks and both Annas rush to pick them up. Asked how the project is funded, Tikhmorova said that she uses her own money. “Officially, the project received a grant from the Mikhail Prokhorov Foundation – we have a nice bus, computer, heater and other useful nice things budgeted there. But in reality there still isn’t any financing. That’s why we have to make money by selling books,” she said. But Bumper is a humanitarian project, not a commercial one. Profit from book sales will be invested in the cultural development programs that Bumper sponsors. 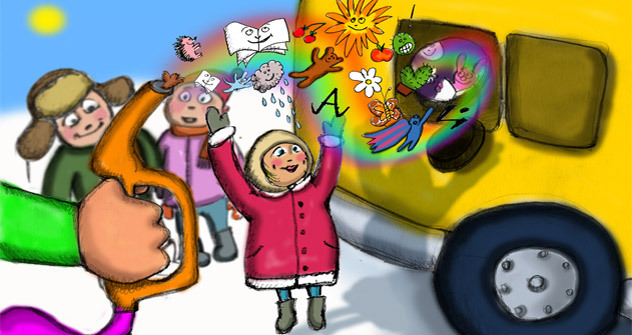 This summer, Bumper will travel around Russia and bring children’s books to regions where there are few or none at all. “In Russia, good modern children’s literature is to a large degree only available in large regional centres like Moscow and St. Petersburg,” Tikhmorova said..
“Perhaps we’ll take some writers with us in our travels if such risk takers can be found,” said Anna the artistic director. “Unfortunately, we aren’t going anywhere today, but we’ll definitely drive you around another time!” Anna said. For now, the bookmobile – with its colorful ottomans and couch, smiling ladies and beautiful books – will only take the children to the literary worlds where there couldn’t be anything better than waking up as a child again.